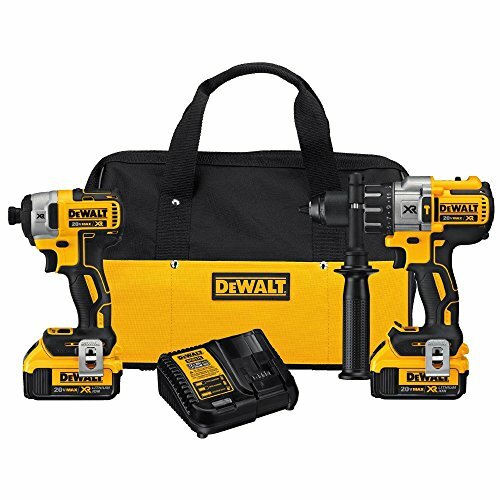 The DEWALT DCK299M2 20V MAX XR 4.0Ah Premium Cordless Hammerdrill & Impact Driver Combo Kit is a combination of the DCD996 20V MAX* 1/2 in. hammer drill, with the DCF887 20V MAX* 1/4 in. impact driver. The DCD996 Hammer drill features includes 3-speed levels, high performance (0-2,000 rpm), an all-metal transmission that optimizes tool-to-task for fast application speeds and improved run-time. This hammer drill offers 0-38,250 BPM for fast drilling in masonry materials. It also has a compact size (8.4 in. front-to-back back length) and lightweight (4.7 lb) design to fit tight areas, and includes 3-Mode LED providing lighting in dark or confined spaces up to 20X brighter than previous model. The DCF887 20V MAX* 1/4 in. impact driver provides 1,825 in-lbs of max torque at fast 0-3,250 RPM speed and 0-3,600 impacts per minute. This impact driver also has a compact size (5.3 in. front-to-back length) and lightweight (3.4 lbs) design. Kit includes: DCD996 20V MAX* XR 3-Speed 1/2 in. Hammer drill, DCF887 20V MAX* XR 1/4 in. Impact Driver, (2) DCB204 20V MAX* XR High Capacity Li-Ion Batteries (4.0Ah), Charger, (2) Belt Hooks, 360° side handle, Contractor Bag.